With spacious corridors, an employee gym, original wood floors dating to the 1940s and a custom-made “live wall” filled with plants, Westland Real Estate Group knew they had something special. Last month, the Long Beach-based company received the a Gold Nugget Award in the Best Rehab Office Project Category for the innovative, modern industrial design of its headquarters on Willow Street in the Wrigley neighborhood of Long Beach. The Gold Nugget Awards recognize “those who improve our communities through exceptional concepts in design, planning and development,” according to their website. A release issued by Westland Real Estate said this year’s competition drew from over 600 entries from throughout the U.S. The company, founded in the late 1970s by Long Beach native Allen Alevy, has grown from a small real estate shop to become a commercial and residential real estate company with an interest in sustainability as well as design. The original company headquarters was located at Long Beach Boulevard and Artesia—”not a nice neighborhood,” according to Lerner. After other departments of the company opened offices in other locations, the company decided to relocate to a property that was already part of their portfolio—a “derelict” 1948 building on the Willow Corridor. Instead, the company took note of the unique 1940s elements, which include wood floors and mid-century building design. About 95 percent of the timber in the building is original, Lerner said. They decided to create innovative design based off of the original building, re-insulating the ceilings from the outside, opening up the office space for a transparent, spacious feel, and creating sustainable uses of energy. Lerner said the Westlake headquarters was a Los Angeles Green Leadership Award finalist for features like solar-paneled carport roofs in the parking lot, LED lighting (with a 15 year warranty), and new paperless technologies for filing. The cavernous main floor features views of almost every corner in the office. 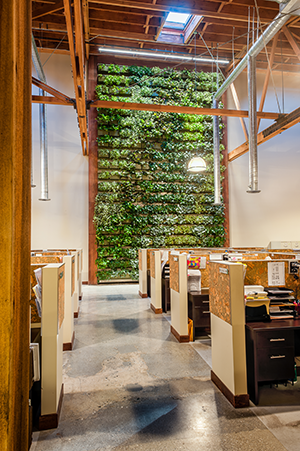 The desks in the central location face a wall full of plants. Besides beautification, Lerner said the plans serve as a means of absorbing sound within the open office, in addition to corkboards. A glass-walled conference room sits on the lofty second floor, visible by every individual in the office. Doing so emphasizes the company’s “transparent” ethos, Lerner said. The company kitchen contains two soda fountains, three microwaves, and an attractive eating area amid exposed wooden beams and glass windows to the outside. A doorway to the company gym reveals numerous exercise machines, a television, lockers, bathroom and schedule for nightly zumba classes. Westland Real Estate will receive the award in a ceremony on June 25 at the San Diego Convention Center. “Gold Nugget Award winners reflect our industry’s best, brightest and most innovative architects, planners and builder/developers,” said Gold Nugget Judging Chairman Lisa Parrish in a statement.